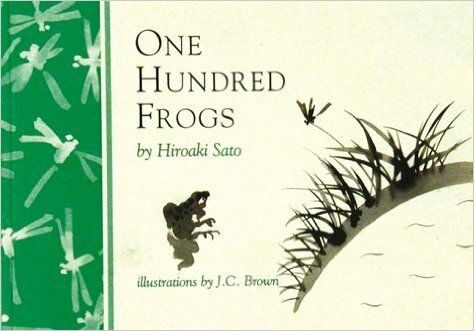 One Hundred Frogs by Hiroaki Sato looks at a famous haiku by Basho. You have probably heard this poem about an old pond and a frog jumping in. This is the cover to an older version of the book which has 100 different English translations of the Japanese original. It’s a haiku (5-7-5) so the poem and the translations are very, very brief. I thought the book was perfect like this. Just looking at all the different ways people expressed the same idea in English. For you and me as students of English it is just perfect. If you can find the original book- snap it up. The newer version I have seen has only thirty translations and then lots and lots of text about Japanese poetic forms. That’s fine, but all the talking takes the magic away form the fresh experience of the poem. Ironically, that staying in the moment is what the poem was all about to start with.